Good ideas demand the very best setting. Whatever the scale of your project, a good score communicates your ideas clearly and unambiguously, a great score can even enhance the playability and performance of your work. 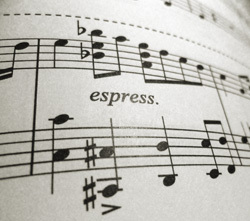 Realise the full creative potential of your music with scores crafted to perfection. The one-to-one service we offer ensures accurate results and the realisation of your vision in the form you intended. We don't just copy your work - we prepare it. In 2015, I was commissioned by The Apostolic Christian Church (Nazarene) to make a reproduction of The Apostolic Christian Hymnal or (as it's also known) the English Zion’s Harp. None of the existing music fonts were found to be even a close match to the typeface or legacy feel of the original and so the task of recreating the original letterpress sorts in an OpenType font, resulted in Hymnal. The first digital font optimised for display in choral music or indeed, any setting which calls for tight optimisation of pages—thus reducing, or otherwise omitting altogether, the need for disruptive page turns. The original Hymnal font created for the English Zion’s Harp contained a limited number of characters. The inventory of characters required, did not include dynamics, clefs beyond the G and the F, ornaments, most of the articulations and more. In the course of developing Hymnal, I have had to look beyond the original text and survey a broad range of contemporaneous texts, all of which pointed towards a fully-fledged font with all the most commonly used characters relevant to a wide range of styles and genres from the Baroque to the Contemporary. The most important design brief I have maintained, is that all of the characters should have the same look and feel of the original characters and should perform just as well—whether or not they appeared in the original typeface. Hymnal is in final stages of development as I speak. The first release in OpenType and TrueType flavours will be configured for Sibelius on PC, but after configuration and testing more equivalent versions will follow, for Finale, MuseScore and Dorico. Many thanks by the way, to Daniel Spreadbury for his invaluable support with the Dorico configuration. The objective is to bundle all these platform dependant versions together and if you purchase a lifetime license for one, you will (as is standard) receive them all—either in the bundled package or as they become available with updates. More details about Hymnal will be placed on a page of its own very soon.